Shortly after 2 p.m., an ambulance crew from Beaver Dam/Littlefield Fire District was returning to their station from an earlier crash involving a tanker on Interstate 15 when one of the crew members spotted a dark plume of smoke coming from the 3800 block of Riverside Drive in Scenic, Arizona. “The ambulance was originally called to the tanker crash on I-15 but it was called off, and while driving back to the station, he spotted the smoke and discovered the fire as he went to investigate further,” Beaver Dam/Littlefield Fire Battalion Chief Andre Ojeda said. 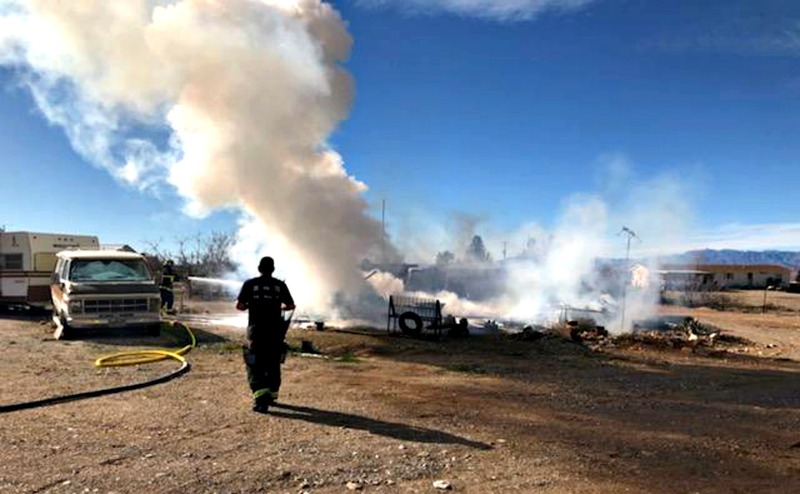 Firefighters arrived with one engine and a tactical water tender to find an outdoor storage structure fully engulfed in flames with a vehicle parked nearby. 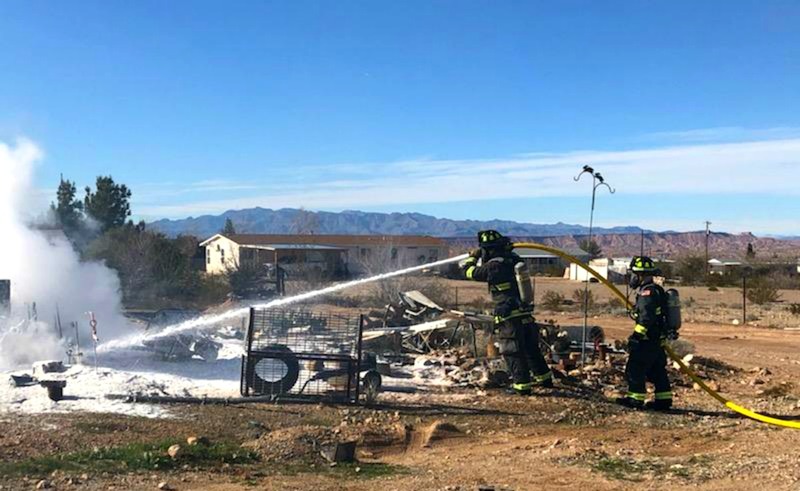 While the Beaver Dam/Littlefield firefighters began an initial attack on the blaze, an additional fire engine and crew from Mesquite Fire and Rescue in Nevada was dispatched to the scene. The firemen joined forces and performed a defensive attack on the fire from the outside, blasting the building with water from multiple angles. As they continued firefighting efforts, several propane tanks exploded and numerous rounds of ammunition ignited, which was the primary reason for the defensive strategy, said Ryan Moore, firefighter and paramedic with Beaver Dam/Littlefield Fire District. Once the fire was knocked down, the blaze was extinguished within around 15 minutes of the first engine arriving, Moore said. The rapid response and aggressive attack prevented the fire from spreading to either the vehicle or any nearby structures. As with many similar incidents, Beaver Dam/Littlefield fire crews were already dealing with multiple calls when the fire was spotted. 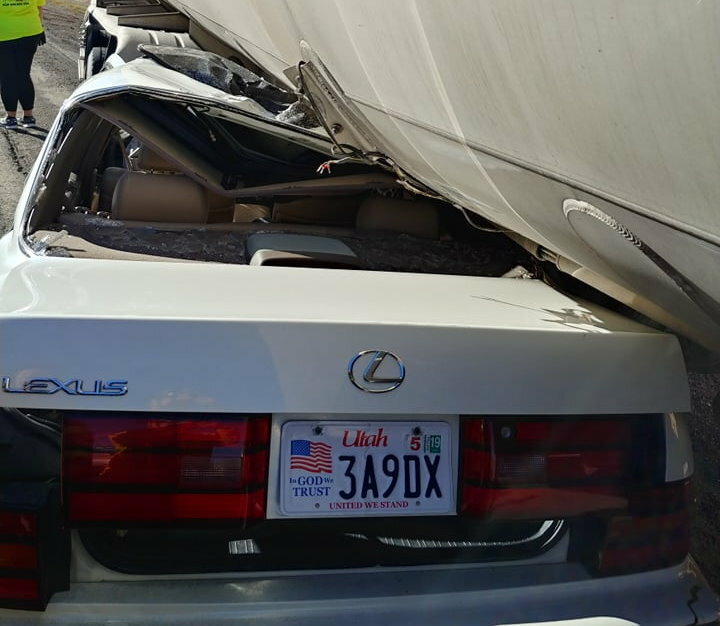 At the time, emergency personnel were still addressing the tanker crash on I-15 when a secondary crash occurred hours later involving a car smashing into the tanker. “The fire was reported in between the two tanker crashes on I-15,” Ojeda said. “That happens a lot, where we are running to incidents reported back-to-back,” he said, mentioning another recent crash involving a Corvette being launched down a 100-foot embankment, which was the first of six calls that came in that same day.